As a key player in the takeaway drinks industry, Boba Box has always stocked plastic cups and straws whilst also being on the lookout for more sustainable alternatives. As plastic consumables tend to be single-use disposables, there is now a global focus to become more conscious of the waste it causes and the harmful impact on nature, wildlife and the oceans. Plastic pollution is a worldwide problem with England alone using an estimated 4.7 billion plastic straws per year. As the UK Government makes steps towards a proposed plastic straw ban for distribution and sale, potentially starting as early as October 2019, we at Boba Box, believe this is the right step forward and will put our expertise in innovative problem solving to contribute towards this lifestyle change. We have been intensely searching for the right solution for both our customers and for the environment and have found several sustainable materials to give our Boba Box customers more conscious choices. We are excited to be able to introduce a whole new range of environmentally friendlier consumables with the knowledge that we are saving nature and wildlife that are affected by our waste, whilst still being able to enjoy our drinks. Over time we would love to be 100% eco-friendly, so first steps towards this are always good. Below is more information about our products so far. Paper straws are a current solution for most retailers who look for alternatives to plastic. With less post-use impact on the environment, recycling paper conserves natural resources, saves energy, reduces greenhouse gas emissions, and keeps landfill space free for other types of trash that can't be recycled. Exclusive to Boba Box, we are now stocking our very own 21cm RAINBOW Paper Straws with padded 12mm width and pointed edge. Perfect for all drinks. Sealed or lid tops. 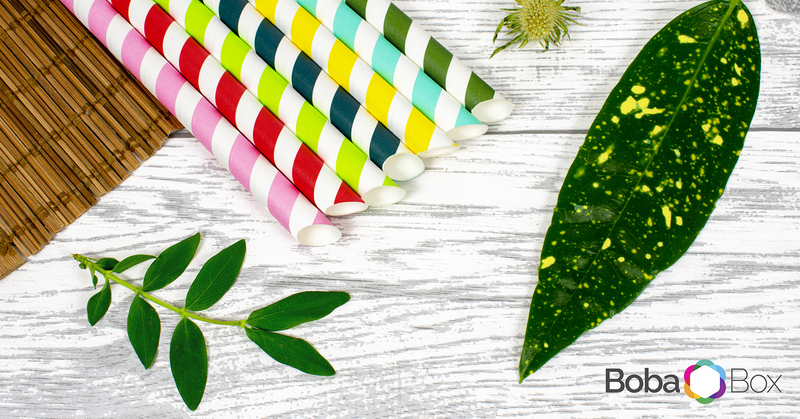 We are particularly excited about this new range as our exclusive paper straws gives you a sustainable, eco-friendly, high-quality fat straw solution. 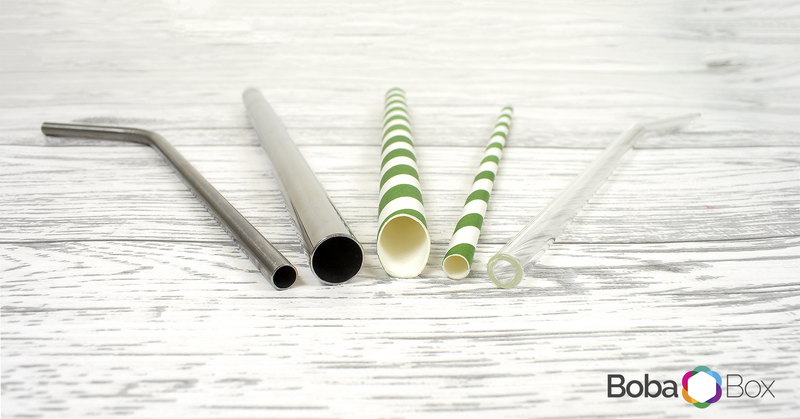 Whilst most paper straws do soften up when soaked in liquid for a long time, we have tested these straws out and found the straws stand the test of time better than a lot of current market solutions and are long-lasting, big enough for your bubbles and strong enough to poke through seals. Make sure you sign up to our newsletter to always stay ahead of new product launches and special offers and discounts only for subscribers. As one of the most environmentally friendly materials with a wide variety of uses, stainless-steel straws means your customers can keep reusing their straws time after time – great for both saving the environment and cutting down on your consumable space and costs. Stainless steel is a green product, it is 100% recyclable. Even if stainless steel is not recycled and it finds its way to a landfill or disposal site, it will have no detrimental effect on the soil or groundwater and subsequent impacts on wildlife and nature. Glass straws were another adventurous idea of ours. We believe that any step away from plastic and into recyclable goods is a great start to a sustainable future. Glass straws gives unique aesthetics to your brand. Whilst designed to be re-used, the environmental benefit is that if the glass is recycled properly, it will take just a month for it to be back on the shelves as a new product. Recycled glass is as efficient as a new one due to glass manufacturers using almost 75% of recycled glass in manufacturing new products. Please do note that glass is prone to thermal shock.